I’m sure most have heard about the eventful hurricane season we’ve had here in the Pacific. Or maybe not, considering that they were overhyped and uneventful, at least for Oahu. When I first heard of Hurricane Hector at the beginning of August, I immediately stocked up on non-perishables and prepared a disaster kit just in case. Hector stayed pretty far South and really wasn’t a concern, but I’m glad I prepared then so that I could avoid the craziness that came with the next storm. I believe there’s been 4 hurricanes/tropical storms that we’ve kept our eye on since then — Lane, Miriam, Norman, and Olivia, and we are very thankful that we weren’t affected by any. They just brought a little extra rain and cooler weather to our island, and Curtis even got a couple extra days off. After Olivia passed, we wanted to get out and go for a hike but wanted to avoid the muddier trails. We decided to revisit Likeke Falls, and this time check out the trail that leads from there all the way up to the lookout off of the Pali Highway. 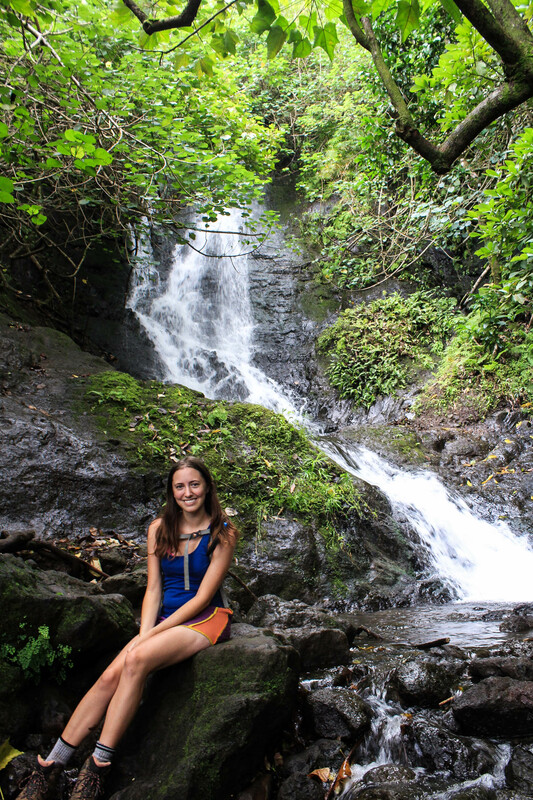 We drove to Kaneohe and parked in the large lot, then made our way to Likeke Falls. This part was short and easy, albeit a little muddy, just as we remembered it. We took a few pictures and then turned around, ready to explore new trails. We took the Likeke Falls spur trail back to the main trail where we turned right and kept going until we reached another 3-way intersection. This is actually where half of my family and I got turned around when trying to find the falls, so I knew that the trail to the lookout was to the left. We followed a narrow contour trail up and down through the forest, sometimes muddy, sometimes overgrown. It wasn’t the easiest to hike or follow, but not unpleasant either. Bug spray was definitely a must though after all the rain! We came to another fork in the trail, and this time were uncertain of the way. We followed it to the left for a while, thinking it would switchback down to the old Pali Highway, but gave up after a while of following the confusing trail. We made it back, then tried out what looked like another trail to the right, but it quickly became clear that this wasn’t the way either. Finally we tried the trail straight across from the original trail, which didn’t look like a trail at first, but once we started it became more clear. It dropped down to a flowing stream and met up with the Old Pali Highway, where we had been trying to get all along. From here, the hike was much easier and was very enjoyable on this cool, overcast day. In Hawaiian, Pali means cliff. The road is aptly named for some rather steep cliffs with a rather storied history. In pre-Contact Hawaii, the Nu’uanu Valley was the fastest way to connect the villages on either side of the Ko’olaus. Nu’uanu Valley gently sloped up to a very low pass before dropping steeply down the Windward face. The Pali is also significant historically as the site of ‘Hawai’i’s Bloodiest Battle’: The Battle of Nu’uanu. As early as 1783, King Kamehameha I began to unify all Hawaiians and by 1795 had assembled an army of 12,000. Armed with muskets and cannon provided by British traders, Kamehameha rapidly succeeded in conquering the islands of Maui and Molokai. He then pushed on to Oahu, landing his fleet of 1200 war canoes near Waikiki beach. From there his army marched Northwest towards present day Honolulu where they encountered the leader of Oahu’s (Chief Kalanikupule) forces near the base of ‘The Punchbowl’. Kamehameha’s army successfully routed the Oahu forces and began pursuing them further up Nu’uanu valley all the way to the Pali. There, whether by choice or pushed, over 700 of the Oahu soldiers fell to their deaths. And so King Kamehameha became ruler of another island and formed the Kingdom of Hawai’i (Kauai and Ni’ihau later submitted to King Kamehameha to bring all 8 islands into the kingdom). In 1845, the first official road was built over the Pali out of cobblestone (portions of which we think can be seen on the trail to Likeke Falls) and in 1898 it was widened, paved, and improved to form the current ‘Old Pali Highway’. During the 1898 construction, over 800 skulls were found, allegedly belonging to the Oahu warriors. 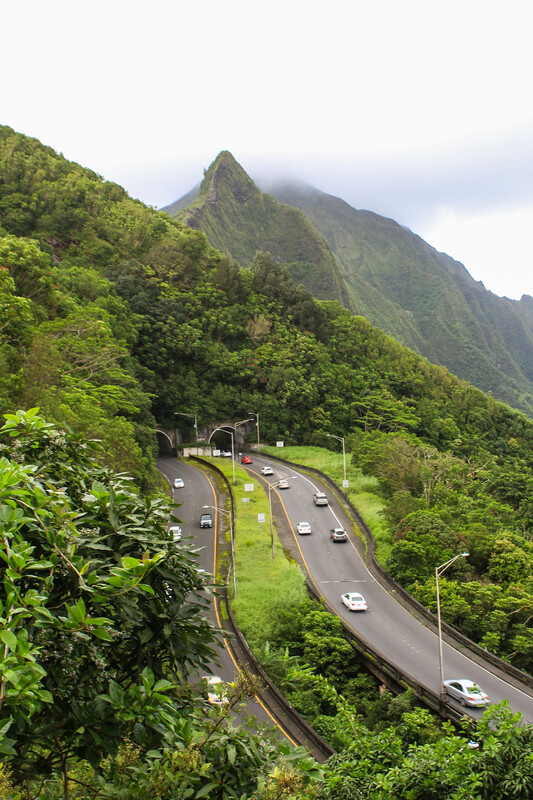 Then in the 1950’s the current Pali was constructed with its set of tunnels cutting through the notch, and the Old Pali Highway was left to be taken over by the jungle. As we started out, the jungle growth was thick around and on the road with lots of White Ginger, and Heliconia in bloom. 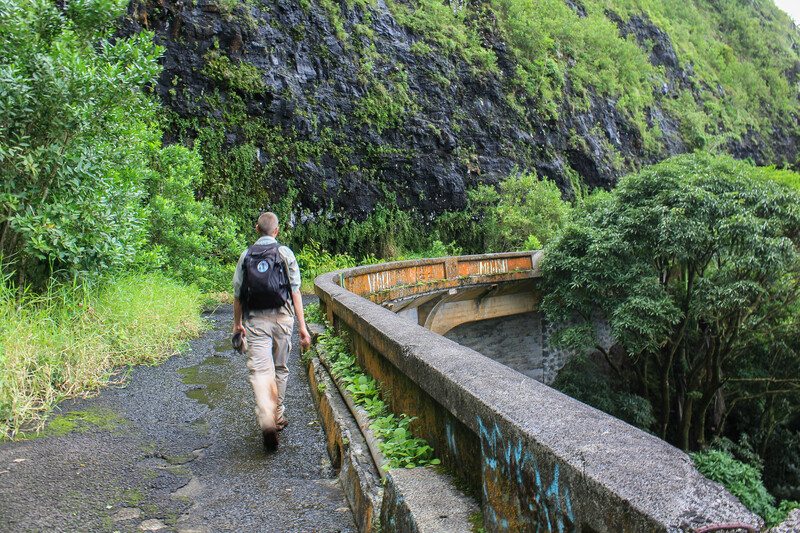 One thing is for sure, we’ve hiked a lot more abandoned roads in Hawai’i than we have anywhere else. Once on the road, the only possibly confusing spot is when the road seems to end near the new Pali Highway. There, we crouched over and walked underneath, then up a ladder on the other side. From here, we took a right, and were soon back on an easy-to-follow road. 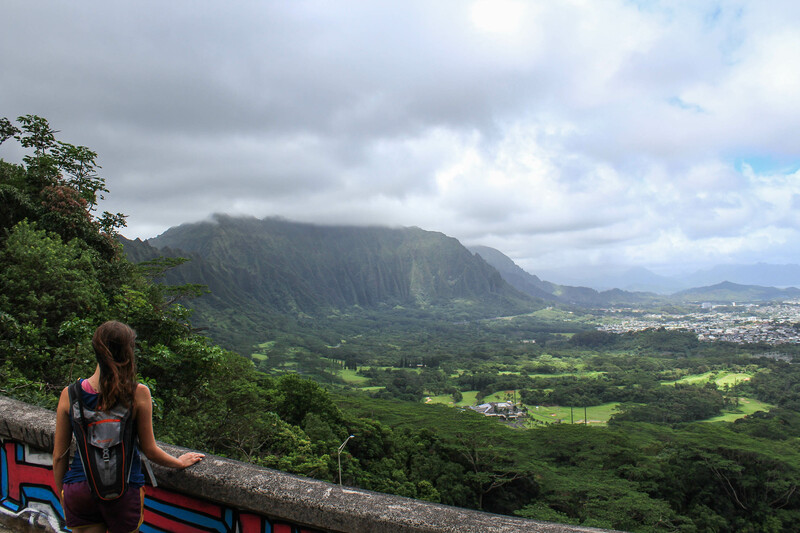 Soon enough, we started finding breaks in the trees and were rewarded with amazing views over the Pali Highway, the Ko’olau Mountains North of us, and the entire Windward side of Oahu. If you can manage to hike this on a day when their aren’t clouds completely obscuring the Pali Notch, the views will be absolutely amazing. There is another tall and impressive waterfall nearby called Twin Falls, which is normally only flowing when it’s raining or right after a storm, as well as a waterfall directly below the road. You can hike to get a much closer view off of the road, but we were able to see one of the falls from where we were and knew that they weren’t flowing as much as they could be. We had been planning to hike up to the lookout, but we found that there is a huge gate blocking the Old Pali Highway from the Pali lookout. I think the reasoning for this is that the area immediately after the lookout has potential for rocks falling off the cliff, so the goal is to keep people from going down and getting hurt. 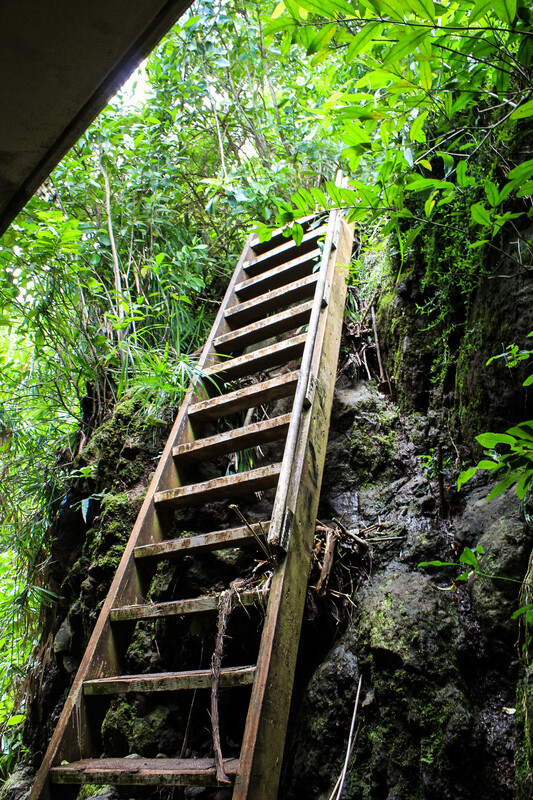 However, as far as we know, hiking up the Pali Highway isn’t illegal — there were no signs at any point in our hike and nothing against it on online trail guides. Still, it was awkward being near the large gate when there were plenty of people at the lookout who could see us on the “wrong side.” Initially, our main reason for wanting to get to the lookout was for letterboxes, but when Curtis realized that one of the boxes was actually on our side of the fence, we decided to stay on this side and save the other one for another day. We were able to find the box — one that hadn’t been found in years, and now needed an update in the clues because of the giant fence — and were very satisfied with this hike. We had one question remaining as we began our hike back: Could we stick to the Old Pali Highway the entire time, rather than having to follow the muddy and overgrown contour trail? The answer was yes! We loved the easy stroll back down the road. With just a little help from Google maps, we figured out where to turn off of the road, and with just a short jaunt on a clear path through the trees, we were right back in the parking lot. Overall, our hike was 4 miles round trip, and you can see our AllTrails recording here. 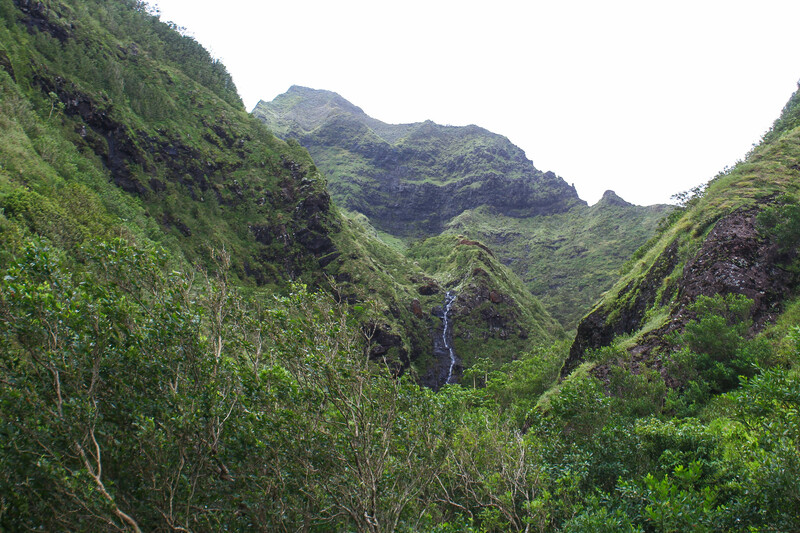 If you wanted to make the hike to the lookout even easier, you could either forgo visiting Likeke Falls, or just do the short and easy hike to the falls and back and then walk the Old Pali Highway up to the lookout. The short trail to the road is to the left when you’re standing towards the back of the parking lot, facing the trail for Likeke Falls (Check out AllTrails or another source for maps or better directions).